It's no surprise that the Hello, Cupcake! book has had a huge fan following. 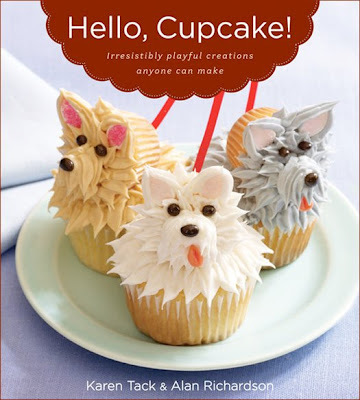 This cupcake cookbook incorporates fun design & decorating instructions to make the most imaginative and cute cupcake creations, such as: spaghetti and meatball cupcakes, pupcakes (puppy-dog designed cupcake), corn-on-the-cob cupcakes, and much more! 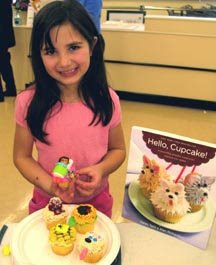 Last week, my niece Juliana, attended the Hello, Cupcake! demonstration at the grand opening of A C Moore in Mt. Laurel, New Jersey. Here is a picture of the aspiring pastry chef & her cupcake. I am so proud of her! "Our demo at the Grand Opening of the A C Moore in Mt Laurel New Jersey on Sunday was a smash event. We were swamped with lots of wonderful and funny cupcakers who came to see us demonstrate the Hello, Cupcake! 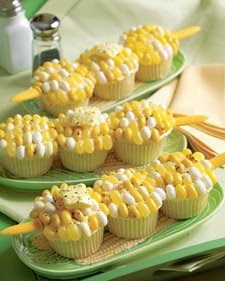 way to decorate cupcakes. 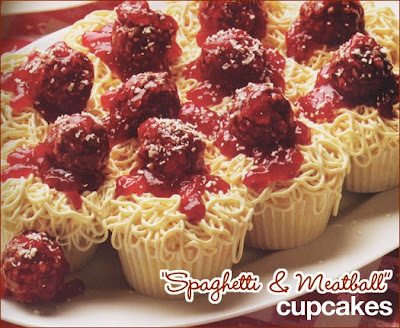 We taught Slumber Party, Sunflowers, Ear of Corn, Westies, and my all time favorite Spaghetti and Meatballs..."